15-1/4" x 10-1/4" x 4-3/4"
Excellent for over-the-road trucks or just back home in your small business. Or you may want it in a remote area of your facility that has fewer employees. Versatile and functional, you will find a variety of products for your comfort and assurance. New, easy to use side door opening two shelf cabinet. Perfect for smaller industrial work settings. 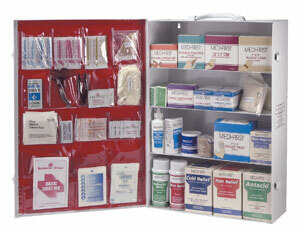 21-1/8" x 15-1/8" x 5-1/8"
A standard in the industry for over 30 years, this cabinet contains an assortment of adhesive bandages, dressing, eye care products, antiseptics, employee comfort items and much more. Convenient door pouches allow for storage of smaller items. Perfect for medium to large industrial work settings. 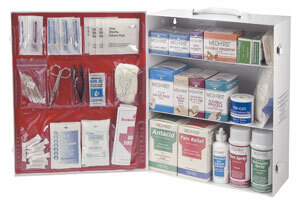 Note: First Aid Cabinet contents can be customized to fit your specific application.